Tyler Austin became a member of the San Francisco Giants on Monday morning. Monday evening, he’ll be batting second, and starting at first-base vs. the San Diego Padres. First night game at @OracleParkSF. 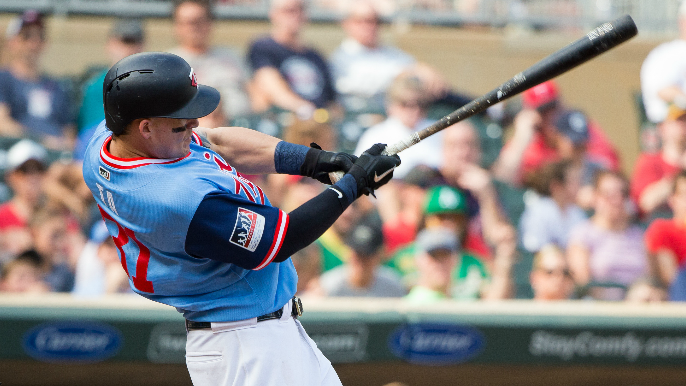 The Giants acquired Austin, a first baseman/outfielder, in a trade with the Minnesota Twins, sending over minor league outfielder Malique Ziegler in exchange. Austin starting at first base pushes Brandon Belt into right field. Austin has played 73 games at first base and just five games in the outfield (one as a right fielder and one in left) throughout his career. Austin, 27, made the Twins’ Opening Day roster and appeared in two games. He set career highs in games (69), at-bats (244), runs (34), hits (56), doubles (10), home runs (17), RBI (47) and walks (19) between New York-AL and Minnesota last season. He was acquired by the Twins from the Yankees in exchange for Lance Lynn last year. Drafted by the Yankees in the 13th round of the 2010 draft, Austin has spent parts of the last four seasons in the big leagues combining for a .232 batting average, 16 doubles, 24 home runs and 67 RBI in 122 games with the Yankees (2016-18) and Twins (2018-19).